Back in the Saddle, er, Kitchen, with a Retro Dip! I can trick myself into believing I’m eating a healthy salad when I serve this with veggies! I hope you all had lovely holidays and that your new year has started off swimmingly! This first full weekend of 2013 finds me back in my kitchen (yay!) with the almost full use of both hands. The bandage is off of my injured right hand and it is getting back to normal. One more week of treating it with kid gloves, so to speak, and I think all will be well. Meanwhile, I’m able to do some slow chopping and other basic cooking necessities as long as I don’t twist or put too much pressure on it. Thanks for all your wonderfully kind comments and inquiries. Believe me, I will go out of my way to try to NOT do this again. 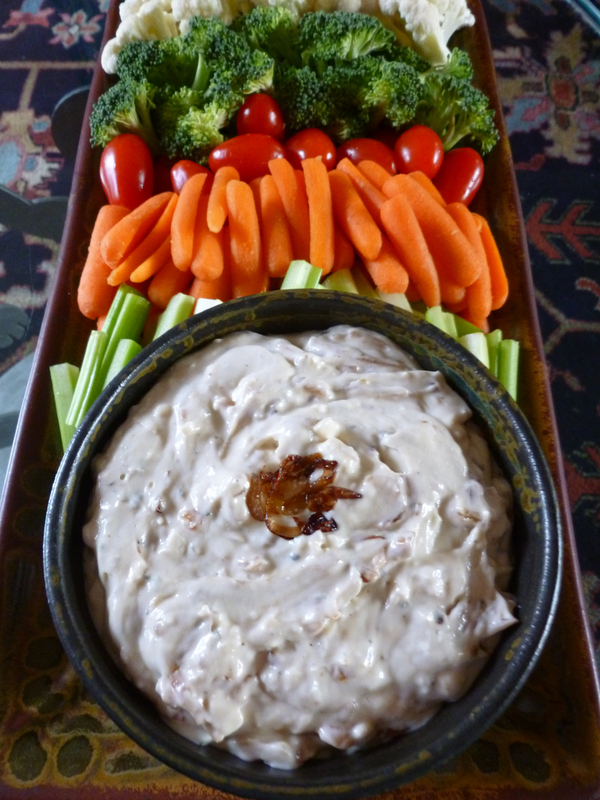 Today I want to revisit and share a relatively easy and very yummy dip recipe from my “repertoire.” For those of you who are football fans, this is a great one to make for the upcoming American football and Super Bowl game parties, or down the road a way for rugby, soccer or baseball gatherings. It’s always been a hit for pot-lucks, Formula One racing parties and as a part of any appetizer spread. It’s definitely a rift on an old-fashioned traditional dry soup-based dip that we’ve all known in this country (and secretly loved), but transcends the original in every way. Yes, we’re talking about the ultimate chip and veggie dip: Caramelized Shallot and Blue Cheese Dip, and I’m making it to take to a little cocktail and nosh event this evening. For those of you who follow this blog closely, you’ll remember a mention of this dip from my two party posts last summer, Party On! and Encore (More party recipes), and those posts get another mention now because they have a lot of other great ideas for appetizers of various kinds to keep in mind for these seasonal bowl game parties. This fabulous dip is from a Bon Appétit recipe, and it’s one that never disappoints or gets old. I’ve adapted it ever so slightly from the original, adding more shallots and blue cheese (can you ever have too much, I ask ya?) for extra flavor, used a lighter mayo and some added seasonings. Here’s my version and you can see the original recipe at Epicurious if your click on the dip name above. Have a great weekend! Warning: Do not make this unless you have someone to share it with. It is addictive. Hmmm. Those shallots kind of look like some sort of weird college logo, don’t they? Start this in time to allow the flavors to blend for a couple of hours before serving. Your caramelized shallots should look like this. Heat the olive oil in a heavy, medium saucepan over medium low heat. 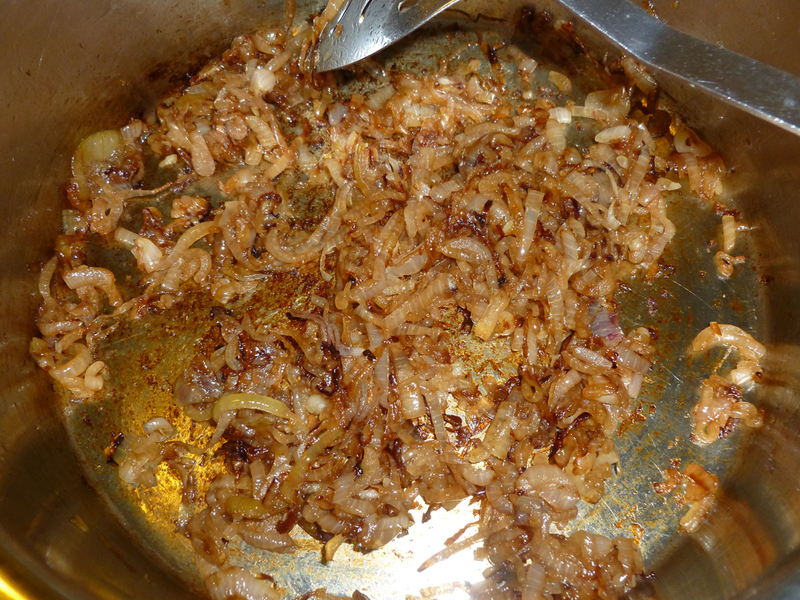 Add the shallots and cook, stirring occasionally, until they are a deep golden brown in color and caramelized, about 15-20 minutes…do not burn. Remove from the heat and set aside to cool. In a medium bowl, combine the mayonnaise and the sour cream until well blended. Add the blue cheese and mash it into the mayo mixture with the back of a spoon or a rubber spatula until it is well blended. Add the caramelized shallots and mix well. Add the salt and pepper to taste or the cayenne if using. Remember, the flavors will build. Cover and place in the fridge for a couple of hours or overnight. Taste and season again if needed. Serve with veggies and/or chips. Confession: There’s a big ‘ole bowl of regular and sweet potato chips in the wings awaiting this dip! 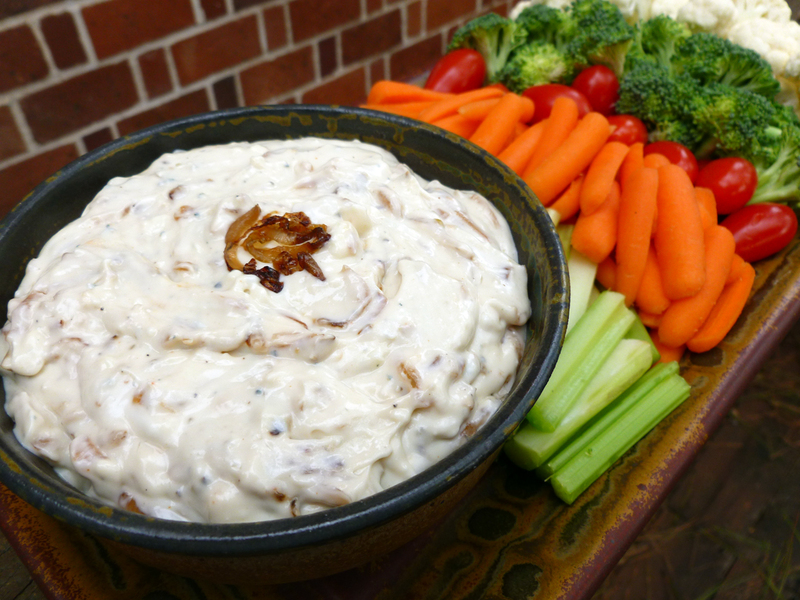 This entry was posted in Appetizers, Food and tagged blue cheese dip, Caramelized Onions, caramelized shallot and blue cheese dip, formula one racing, game parties, onion dip, pot luck appetizer, Retro dips, Shallots, Super bowl party by bitsandbreadcrumbs. Bookmark the permalink. I now follow you on Twitter. Can’t believe I didn’t already. Anyway, this looks awesome and reminds me of a guilty pleasure from the wife’s childhood — onion dip. Trust me this is way, way better! Hi Greg, thanks for the Twitter follow. I’m still better at FB and email, but am coming around to Twitter….so need to follow you there, too! Yes the dry soup-based dip that I alluded to above is the infamous “French Onion Dip” a la Lipton, that some of us grew up with. And yes, this really is way, way better, LOL! I will have to remember this for future party food, or even my book group – we do snacks!! Hi Claire! This would be great for a book group event, I think. You need a group to eat it so you won’t eat it all yourself…or that’s the case with me. 😉 I am glad to have the hand more functional and mending, thanks for your good thoughts. I think I tore a tendon so it is slow…but sure. This is a dip I will be making in the future, has blue cheese in it, so got to be excellent. Glad you are back in the saddle. Great looking dip for tomorrow’s playoff games! This sounds delicious. Now if only we were having a party! Glad your hand is getting better. Hi Barbara, and I hope you’re feeling much better after your fall. The hand is much better, but I think I pulled or tore a tendon, so it still has a way to go. Working with two hands again is great, though! Perfect for the Super Bowl with veggies and chips, it should keep everyone happy. Yes, you can’t feel too bad about eating it if you have a healthy choice, right? 🙂 Thanks, Karen, and have a great day! So nice to see you are back in the kitchen!! 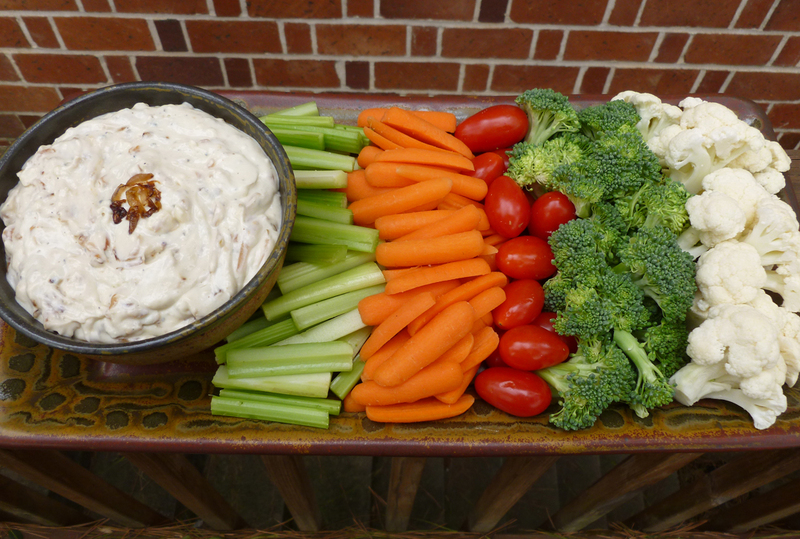 This is a great dip for football games or any type of party! I made this a long time ago and completely forgot about it! Thanks for sharing; I will definitely be making this for one of the upcoming games!! Thank you, Linda! I can’t even remember when I saw this dip first…know it was when one had to tear recipes out of magazines because they weren’t online then. 😉 It’s been a fave that can be tweaked easily. And definitely a hit at parties! I love dips and would probably have to make it when I was sure there would be no one around to have to share it with! That could be quite dangerous, LOL! I’m converting some leftover into salad dressing…or plan to attempt it…so I can feel good about not wasting it, don’t you know? My thoughts exactly! If you have enough veggies they must balance out those chips, right? One of my all time flavour combos, Betsy, thanks for the reminder. I would love to make it again for the Christmas re-do on Sunday but sadly my brother is allergic to blue cheese (hideous, isn’t it?) so it would not be nice if I made it. But I will remember to book mark it. I can imagine how amazing it tastes with the caramelized onions. Everything about this dip says “I’m your best friend.” I love blue cheese and carmelized onions, so I could really spend a lot of time with this dip. I could see making this alongside a big mess of wings as well. Wing night here I come!!! Hope the hand continues to be on the mend! Hi Barb, and thanks for the good thoughts on the hand! I’m with you, this dip would be great with wings. In fact, it’s great with everything and hard to stop eating…even when you want to! 🙂 Hope all is well with you and yours. If you love blue cheese, you’ll love this, that’s a fact. Unless perhaps you don’t like onions, of course! 😉 Love your name, Scrambled Megs and must come and visit you. Thanks for stopping by and for your comment! Oh snap (can I say that?) Betsy! I think you already knew that this dip was right up my alley. Definitely on the to-make list for the football games! I can certainly believe that this dip is addicting! I looks lovely! Off to raid the fridge to see if I can recreate something similar without going anywhere…I’m hungry! Even without the blue cheese and with plain onions caramelized, this would be good. I always have a few onions on hand! Hope you enjoy…thanks, Brydie!